Happy Monday! Hope you all had a great weekend. I met a few out of town friends for brunch, bought myself gorgeous tulips and washed all the hardwood floors in my condo. I also cooked lamb: more on that later this week. Isn't it funny how things work out sometimes? A few weeks ago I received a Thermapen to test out in my kitchen and was looking through my collection of cookbooks for a recipe that would test out the qualities of this high end instant thermometer. 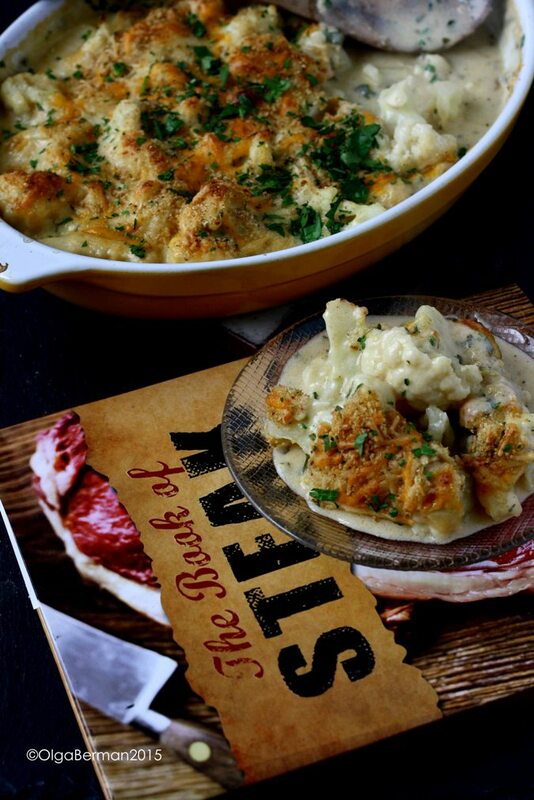 I did not find anything that called my name meat-wise, but did find a drool-worthy recipe for baked cauliflower. No, this recipe doesn't require an instant thermometer: I'll have to use it elsewhere. I made a few changes to the original recipe such as adding a bit of heat with chipotle chile powder and a bit of crunch with panko crumbs. 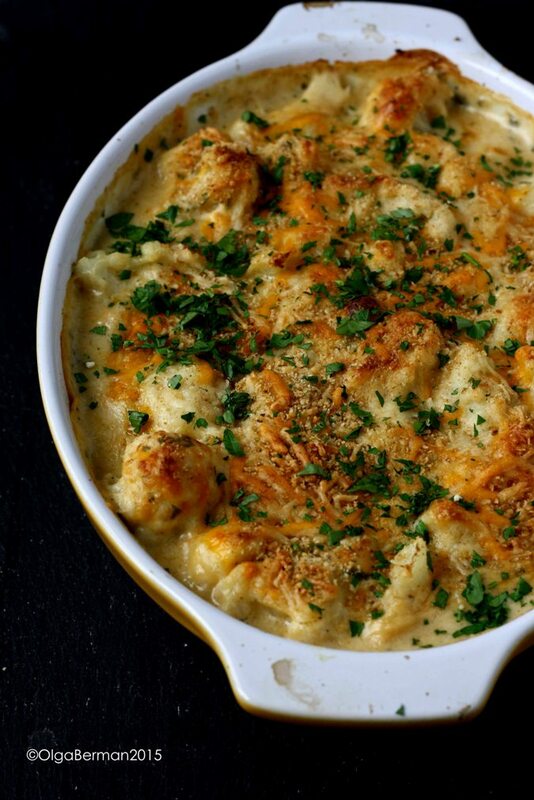 I realize it's a zillion degrees out now, but you may still want to make this Baked Cauliflower In A Cheesy Sauce side for your Meatless Monday dinner tonight. 1. Bring a large pot of salted water to a boil. Add the cauliflower florets and cook until al dente. Drain. 3. Pour the wine and add a bay leaf to a saucepan. Boil until the wine reduces by half. Add the milk, butter, and flour and whisk until the mixture becomes smooth. Continue whisking until the mixture comes to a boil and thickens. 4. Take the saucepan with the wine/flour mixture off the heat. Remove the bay leaf. Add 2/3rds of the cheese mixture (after mixing the two cheeses together), mustard, parsley and chipotle chile powder. Season with salt and black pepper. 5. 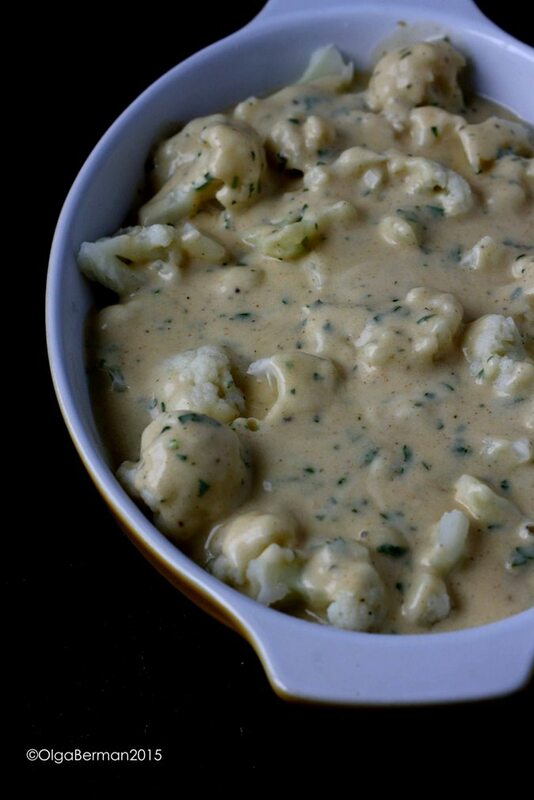 Pour a bit of the cheesy goodness into a baking dish, top with the cauliflower, and drizzle the rest of the cheese sauce on top. 6. 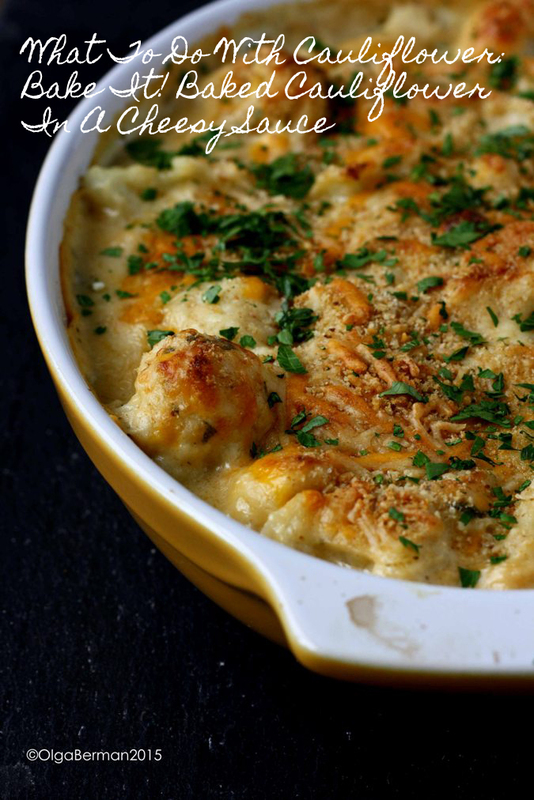 Combine the rest of the cheese with the panko crumbs and sprinkle on top. 7. 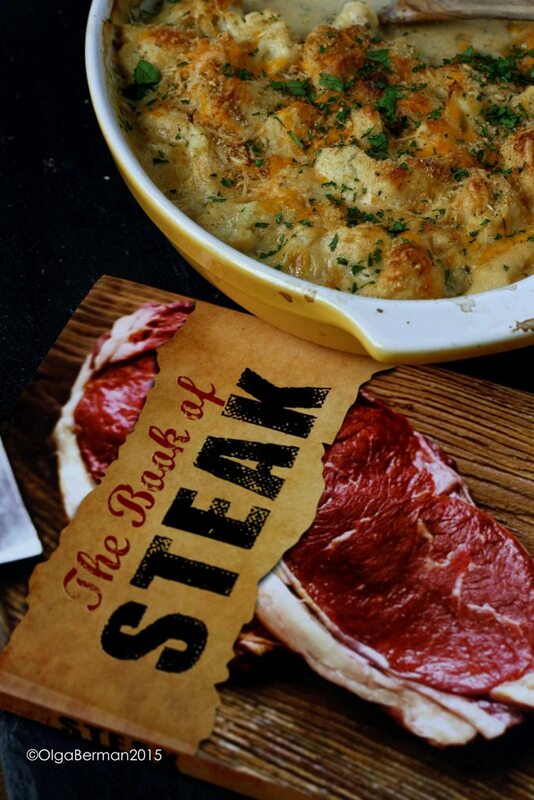 Bake the casserole for 25 minutes or until the top is golden brown. Serve garnished with fresh parsley. How beautiful does this look!? Your house will smell incredible. 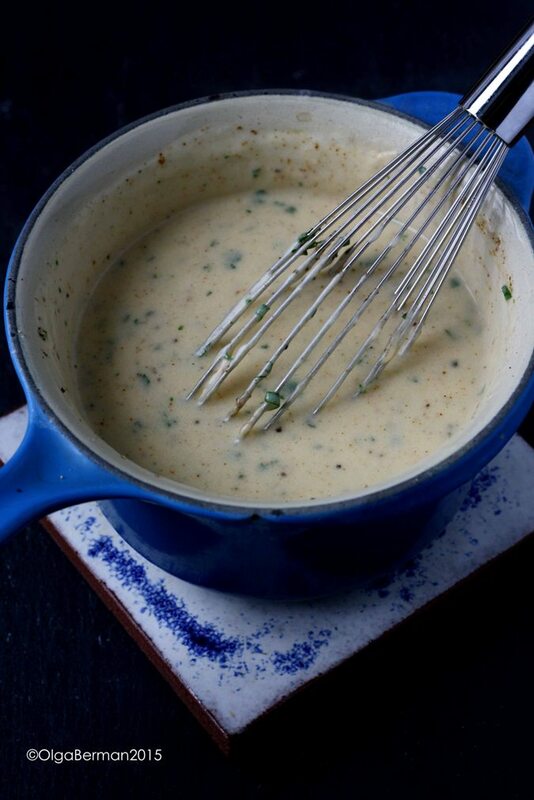 The cheesy wine sauce in this recipe would also work with pasta, potatoes, or mushrooms. I can even see it in a rice/chicken casserole. Definitely experiment with it. I'm not sure why, but the dish was more saucy/liquid'y than I expected. Maybe next time I'll add more flour or bake the cauliflower for a longer amount of time. The sauciness did not bother me though. My favorite part of this dish was the upper crispy cheesy layer! 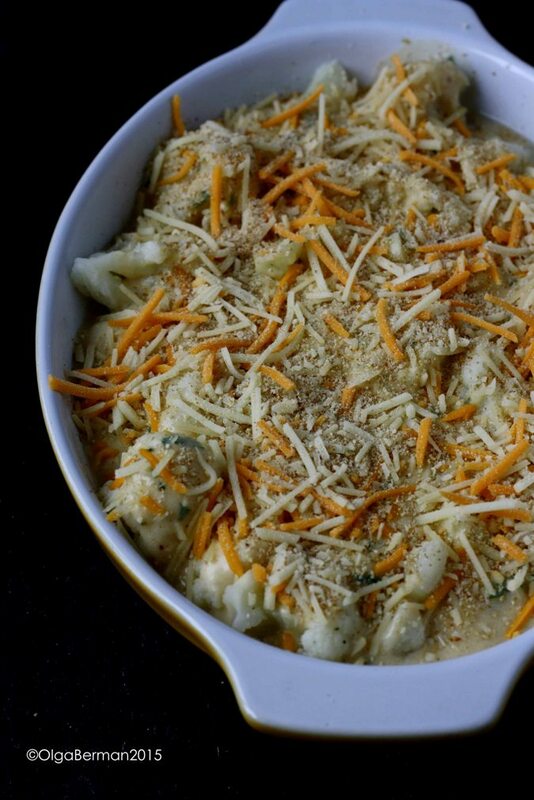 What have you been making with cauliflower?